Frances Mayes - August So Soon! Could you–I could–live in a place that was eternally summer? This summer is especially delicious–today I am picking up at Walker farm fifty pounds of Romas to make pomarola for the coming months when the weather is not so fine. Later in the week, I will roast another fifty pounds of mixed tomatoes, pack them tightly in jars and cover with olive oil. They are so great to have on hand during any season. (See The Tuscan Sun Cookbook for both methods.) My own tomatoes are coming in too, but it seems that some creature takes a bite out of each one one day before it’s ripe. I have made every kind of yellow squash I can think of. Just sautéed with onion then a little cream and parmigiano stirred in seems best, especially if topped with seasoned coarse bread crumbs. No creature seems interested in squash. Something already has eaten the corn, all of it. I set out the catch-and-release trap twice–expecting to catch a raccoon and release him miles from here–and caught first a possum, then a skunk, the latter being quite a shock. Ed was in Italy so I called on the handy, handy man who helps us, and he approached the trap slowly, holding up a sheet of plastic and a stick with a hook. He deftly lifted the trap door and the skunk just looked up at him and didn’t move. We didn’t want to rattle his cage! Finally he ambled out, waving his glorious tail but refraining from spraying into the soft summer twilight. The raccoon remains at large. North Carolina can be blistering but this summer has been lovely. At night I walk out on the porch a couple of times just to hear the loud, teeming, rhythmic night chorus and to inhale the moist, fragrant scents. Right now, the ginger lilies are perfuming the air. 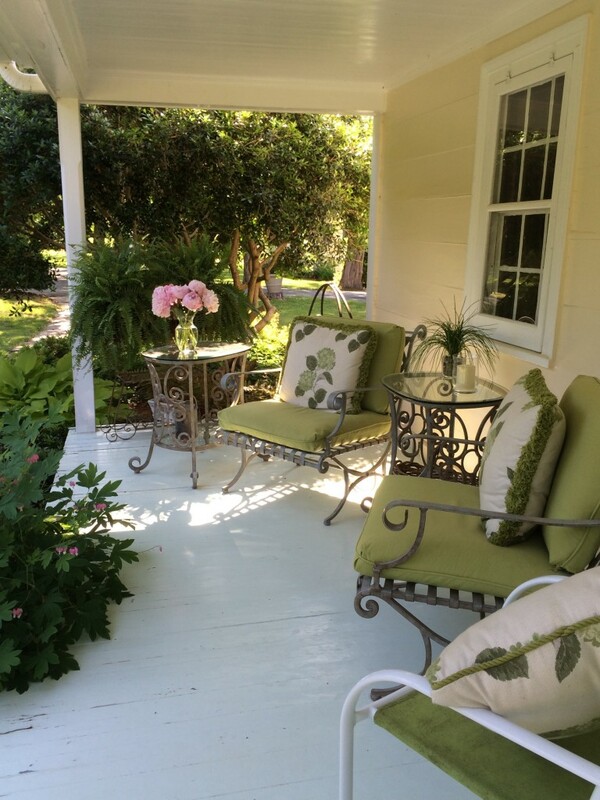 The front porch is a good perch for reading, a glass of iced tea, and for visiting. If you’ve read Under Magnolia, you know already that the lively air of the South has drawn me back all my life. In summer, I am in paradiso. Soon, I’ll return to Italy, but two months of southern summer suits me! 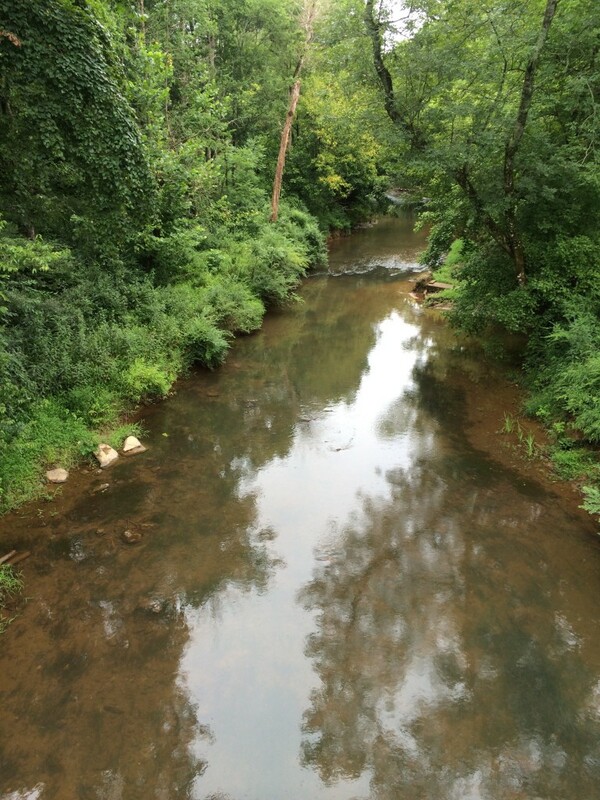 This is the Eno River that runs by our meadow. This is taken upstream where there’s a bridge. 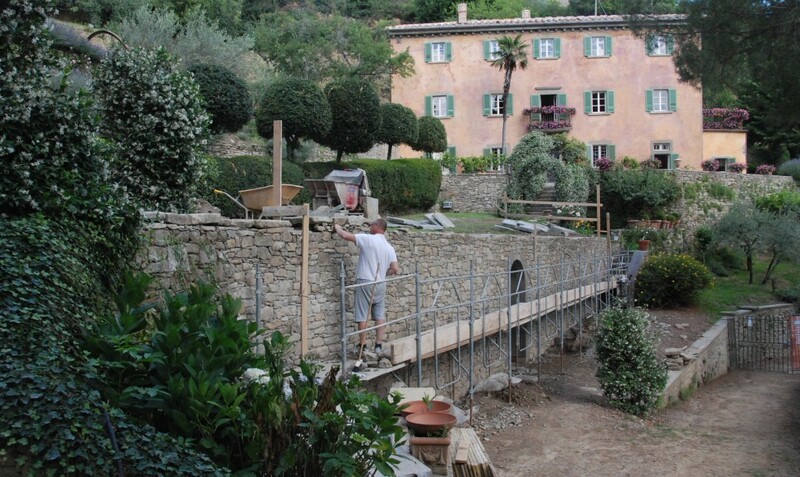 Back in Italia, the restoration at Bramasole continues. Is this my life’s work? 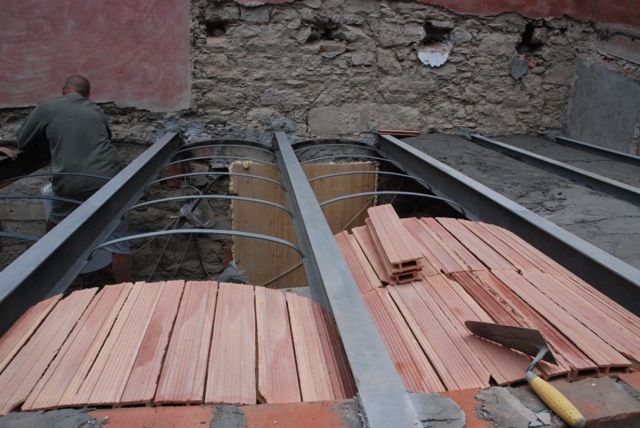 Here are the new beams, new outside wall for the old limonaia at the back of the house. Soon (?) to be the kitchen. 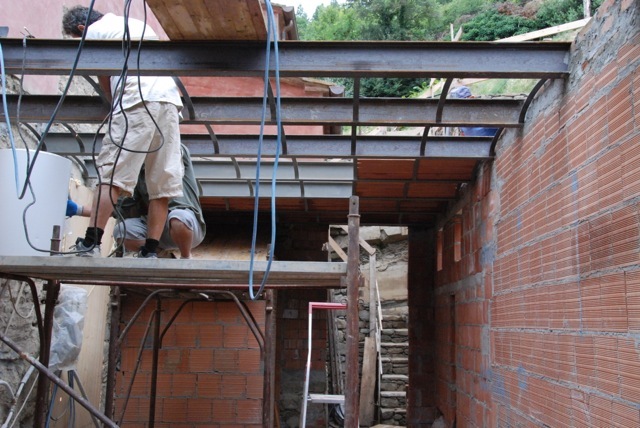 The ceiling will be coved. Ed has been a commuter, and what a long commute. Praise the travel gods for the nonstop from Charlotte to Rome on US Airways. We loved having our grandson in Italy for all of June. He studied intensive Italian at Polimnia in Cortona. We took the Frecciarosa fast trains on weekends to Venice, Rome, and the Amalfi Coast. The new trains are superb–comfortable, wifi, drink service, dining car, and, oh, so quick. We are thrilled that Willie’s a born traveler–curious and ready and open to any adventure, especially if it involves trains and boats. 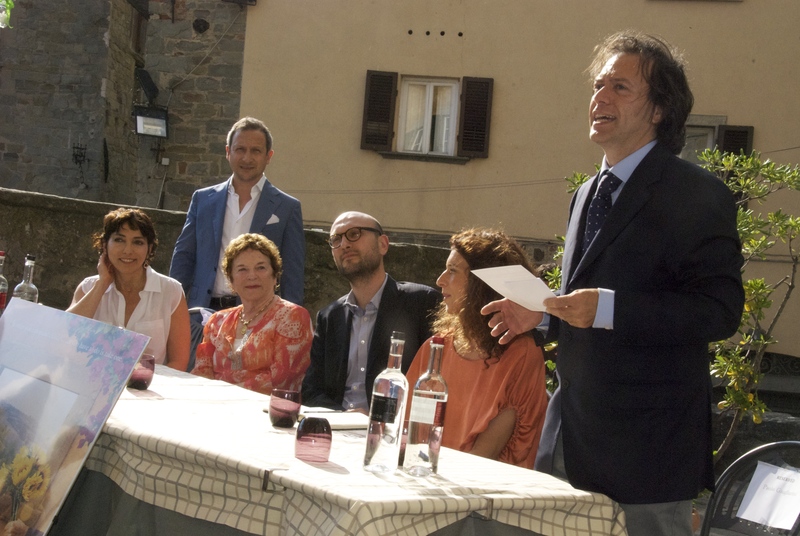 A very special event in June was the launching of the Tuscan Sun walk around Cortona. Signs have been placed at historic sites, places I mentioned in my books, and places shown in the movie of Under the Tuscan Sun. Everyone was so pleased that Audrey Wells (on the left), screenwriter and director, came for the opening of the walk. When I brought him back to his mama, who missed him terribly, Ed stayed on at Bramasole to oversee, to make the innumerable decisions and to deal with the inevitable dismaying discoveries that happen with old houses. The best news is that the work is impeccable. We have talented stonemasons whose patience I only can admire from afar. How they manage to keep chipping stones perfectly and hauling them from A to B, I don’t understand. But they do derive enormous satisfaction from creating something like this. We changed the color of the shutters from brown to dusty green. The cabinets are being made now. I found glass pendant lights at Schiavoni http://www.renoschiavon.it/index.html on the island of Murano. I’ve ordered a big blue stove. Soon we will be stirring ragù and popping open a glass of something very good! With all the travel, I’ve had time to read, although on one flight I got hooked on Sherlocke Holmes and watched three episodes without stopping. The Essays of E. B. White–I’ve read his essays over the years but found it inspiring to stay with the whole collection. Wish I’d known him! Bobcat by Rebecca Lee–Subtle short stories that move in surprising directions and come to a real conclusion. I don’t like short stories that drop off into an abyss and you’re left wanting to turn the page. Mona Lisa by Diane Hales–Only a smattering of information remains about La Giocanda but this book puts her life in the context of her time, giving a rich portrait of women’s lives in that era and the larger context of history, economics, and art. The Bigness of the World by Lori Ostlund–Another deft book of short stories, these set in far-flung places, focusing on relationships that just-miss. Often funny, satirical, and touching. The Gray Notebook by Josep Pla–A charming, compelling journal kept by this Spanish writer starting in 1918 when the influenza epidemic sent him home from Barcelona, where he studied, to coastal Spain. Love his voice, his acute observations, and the evocation of an era. As always, I would love to hear your summer recommendations. I hope everyone reading this is enjoying luscious summer meals of tomato tarts, fried okra, peach pies, watermelon and tomato salad–and squash casseroles! May summer linger long.